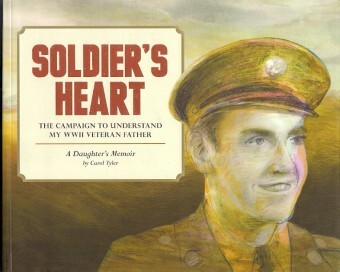 My post-Christmas pick of the week is Soldier’s Heart: The Campaign to Understand My WWII Veteran Father by Carol Tyler [Fantagraphics Books; $39.99]. In a year filled with wonderful graphic fiction and non-fiction, I fully expect this book to be among the finalists in each and every comics industry awards. In over 350 pages, Tyler examines her rocky relationship with her dad, a World War II vet who saw combat in the Battle of the Bugle. His war experiences changed and, in many ways, damaged him forever, just as post-war events would change both him and Tyler’s mother. The main focus of the three books collected in this omnibus edition is the cartoonist’s search for what made her father the way he was and is. Yet, wrapped around that search are so many other poignant explorations for the cartoonist and those she loves. A husband who leaves Tyler and their daughter to be with another woman, only to be unable to decide which relationship will bring him the happiness he seeks. Tyler trying to be the adult for her child, her parents, her straying husband. By the time I finished reading this book, I was equally in awe of her as a comics creator and a person. Placed strategically throughout the volume are chapters devoted to a scrapbook Tyler makes of her father’s wartime experiences. These remembrances have the same power as Sam Glanzman’s U.S.S. Stevens stories from the 1960s and 1970s DC Comics war titles. That’s the highest praise I can give them. Soldier’s Heart is graphic non-fiction that demands your attention. It’s not a book you can breeze through. It’s a book that needs to be read slowly, savored and thought about. I can’t imagine it not being part of my personal comics library and I think it should be part of yours as well. It also belongs in every public and school library in the country. And if you’re looking for a graphic novel to win your friends over to the wonder of comics, this book should be among those you share with them. If the mid-1960s were already an exciting time for comics readers, what with Marvel getting better every month and DC trying some new things and Jim Warren publishing Creepy and Eerie, Tower Comics hit the stands with T.H.U.N.D.E.R. Agents, spin-offs Dynamo and Noman, and Undersea Agent. With a super-heroes and super-spies written and drawn by the stellar likes of Wally Wood, Reed Crandall, Gil Kane, Steve Ditko, Mike Sekowsky, Ogden Whitney and more, comics readers were catapulted into a exciting new universe of action, drama and visual thrills. We loved those comics. 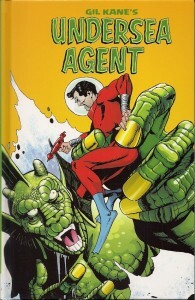 Gil Kane’s Undersea Agent [IDW; $17.99] collects the four Undersea Agent stories penciled and inked by that legendary comics creator. Even working in the DC house style, Kane was able to shake things up there more than almost any other artist. With side gigs at both Marvel and Tower, he was able to ink his own pencils. The result? Some of the most explosive comics art of the 1960s. Even the panels of characters giving exposition were infused with a high drama only rarely seen in comics prior to this era. The storytelling lessons Jack Kirby started teaching in the 1940s were finding voice in an entire generation of comics artists. Kane’s art on these four stories looks wonderful in this handsome hardcover edition. Though he did not write these stories – even the book’s introduction gets that wrong – he was teamed with two of the best writers in comics: Steve Skeates and Gardner Fox. “The Will Wrap” by Skeates and Kane is a solid evil scientist tale in only ten pages. In today’s super-hero comics, the kind of threat represented by the aptly-named Dr. Malevolent would probably fill six issues. Changing things up, the duo’s â€œTo Save a Monsterâ€ is a terrific creature feature with ties to The Creature from the Black Lagoon and the countless kaiju who have moved and entertained their audiences on the big screen. The Fox/Kane collaborations run 20 pages each. “Born is a Warrior” is an examination of heroism. “Doomsday in the Depths” is a fine “lost world” adventure. They are even better than I remember them from five decades ago. If you’re an old-time comics fan like me, you’ll love this volume. I’d like to think younger readers will be able to appreciate these stories as well. I give this my high recommendation. 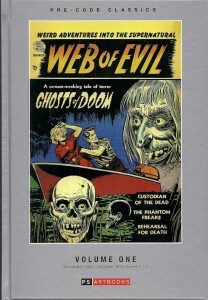 Web of Evil: Volume One [roughly $45-50] is the latest in the “Pre-Code Classics” series from PS Artbooks. In recent months, because the quality – no pun intended – of PS’ reprinted horror stories has been more down than up, I’ve been weighing my purchasing decisions more carefully. These “Pre-Code Classics” volumes are no longer a sure purchase for me. This hardcover volume has Web of Evil #1-7 [November 1952 – October 1953], originally published by Quality Comics. Quality was one of the better publishers of the 1940s with titles like Plastic Man and Blackhawk. In the 1950s, the publisher tried a little of everything and that included this one horror title. There are a lot of reasons to buy Web of Evil Volume One and other “Pre-Code Classics” books. You get to read comics you would likely never see otherwise. You get a glimpse into the dangerous world of comics in the 1950s. You find little-seen treasures like the Jack Cole stories in this volume. If you’re a fan of 1950s horror comic books and/or a student of comics history, those are too more good reasons to buy this book. At $50 a pop, buying these collections is something you should consider carefully. Here’s hoping you had a most merry Christmas or whatever holidays you celebrate at this time of year, and that 2016 is a truly happy new year for you. I’ll be back next with more reviews.